Michael Conathan argues that farmed fish are a fact of life and we should continue efforts that attempt to make the practice safer. New Open-ocean aquaculture technology could help increase food and water security while reducing the environmental impacts of fish farming. Deficiencies in the regulation of the American food supply constitute the most serious and persistent gap in American consumer protection. Congress must seize the opportunity to fix the problem. Fifty years after we figured out how to keep astronauts’ food from making them sick, the time has come to commit to keeping the rest of us as safe. Would You Like Some Data With Your Safer Food? The answer is a mix of politics and profits, two things that should not get in the way of national standards for school nutrition to help better educate our youngsters. The peanut product recalls continue, revealing more cracks up and down the food safety system. And people keep getting sick. The salmonella-contaminated peanut outbreak is raising alarm over the U.S.’s fractured food system—a system “organics” and conventional mass-market foods often travel through side-by-side. Part of the problem behind the recent spread of Salmonella-infected peanut paste products is a disastrously underfunded FDA. Whether by DNA manipulation or old-fashioned selective breeding, we engineer our food. Is it time to get over it? Nutritious Rice for the World runs out of the University of Washington, but pieces of the research work could be unfolding on a desktop near you. That’s because the research is one of five projects currently part of IBM’s World Community Grid. The grid allows volunteer computer users to run a small program that takes advantage of unused processing power to predict the structure of desirable rice proteins. 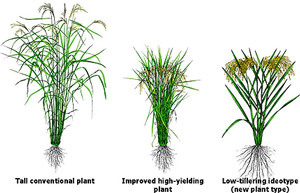 A comparison of different rice types. "The fundamental problem with food shortages in the world is one of distribution," Samudrala says. "Creating distribution chains costs money. We overcome that by designing new crop species that indirectly address this problem by providing higher yields but also better nutrition and adaptability to local and global environments." This is doubly significant in the wake of this year's food price spikes and the resulting crisis. One of the catalysts of the price increases was the skyrocketing cost of transportation fuel. Press coverage of the project has been significant since the launch in May of this year. Got some unused CPU power under the hood of your PC? Anyone can register for the grid.